In an ideal world you’d be able to work full time, have a full class load, maintain some sort of social life and balance it all perfectly. Unfortunately, we don’t live in an ideal world. Having a job while attending college is one of the keys to avoiding monstrous piles of student loan debt. But it can be hard to find a job that allows the flexibility you need. This is where an online job can come in handy. There are hundreds of perfectly legit ways to earn a part time income on your own hours from the comfort of your home. 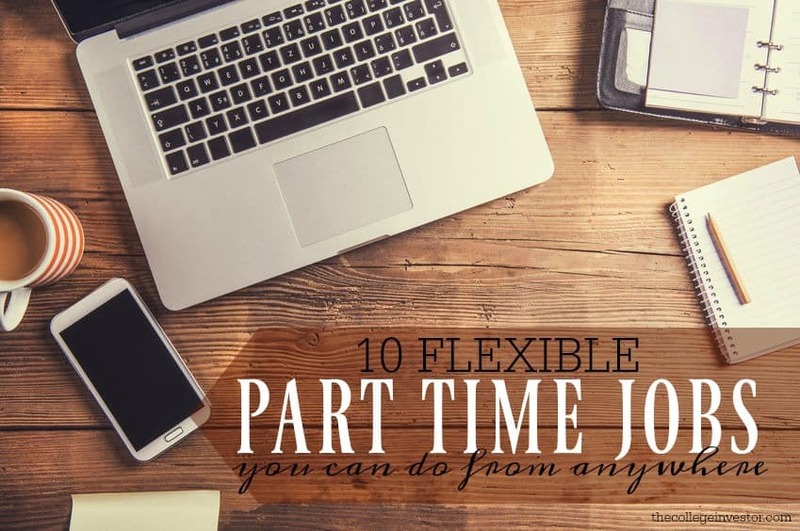 These ten flexible part time jobs are a great fit for college students. Big search engines like Google and Yahoo hire evaluators to make sure that the search results listed for specific search terms are relevant. These jobs generally pay $10-$15 per hour and are very flexible. To be considered for a search engine evaluator job you’ll need excellent research and communication skills. Freelance writing is how I started my work from home journey and is one skill that is in huge demand. As more and more companies build their presences online the need for competent writers has grown as well. The pay of a freelance writer can vary greatly. At the low end you can expect to get $20 per article and at the higher end you can earn $500 or more. The pay you earn depends upon your areas of expertise, your writing abilities and how well you’re able to market your services. The beauty of freelance writing is that, while you’ll have deadlines to meet, you won’t have a set schedule. You can also scale up or down on work as your other commitments fluctuate. If you’re interested in earning money writing check out this post: 14 Ways to Get Paid to Write. Another higher paying freelance job is a social media manager. The median pay rate for a social media manager is $14/hour, however, if you are effective at your job you can certainly earn a much higher hourly rate. You can look for social media positions at sites like Upwork.com or Montser.com or you can pitch local businesses. Transcriptionists listen to audio and transcribe that content into text documents. There are a number of different transcriptionist opportunities – medical transcription, transcribing podcasts, transcribing speeches and more. There are also many scams when it comes to transcription so you need to be wary when looking for these types of jobs. A general rule of thumb is to never pay to get a job. The average pay for transcription sits right around $15 per hour. However the pay will depend upon your speed and accuracy. Most companies will require you to pass a skills test if you’re a new transcriber. Tutoring jobs have always been great options for college students but can be cumbersome if you’re working with a busy schedule. Tutor.com will allow you to work as little as 5 hours per week and up to 29 hours per week. You’re able to schedule sessions ahead of time according to your schedule or you can pick up one of the available sessions at any time. There are broad range of topics in need of new tutors. You can check out that list here. Companies always want to make sure their websites are user friendly and attractive. This is where website usability testers come in. As a website tester you review a website and (normally) record a video of you using that website along with your audio commentary. If you have good communication skills this could be a perfect fit for you. UserTesting – Pays $10 per test. UserFeel – Pays $10 per test. Analysia – Pays $10 per test. Data Entry jobs are not the highest paying online jobs but can be a good fit for beginners looking for fairly simple work. As a data entry specialist you take a set of data and organize it or put in a specific program. You can expect anywhere from $6-$12 per hour for this type of work. Have you ever had a question that you needed an answer for but didn’t feel like researching yourself? There are now freelance research sites dedicated to answering those questions. AskWonder is one site I’m familiar with that hires freelance researchers to answer their customers’ questions. The pay varies depending on the complexity of the question being asked. The top researchers at AskWonder earn up to $35 per hour. If you like teaching and are looking for a way to earn doing it there are many places seeking ESL (English Second Language) teachers. These positions require the ability to teach English to non-native English speakers. You generally do not need to know a second language. If you’re interested in becoming an ESL teacher you can browse some opportunities here. You can read here how Robert built a blog in his spare time and sold it for $11,000. While this particular job isn’t going to earn you immediate income it could definitely pay off down the road if you’re willing to put in the effort. There’s an abundance of flexible part time jobs online but it might take a little trial and error to find the one that best suits your skills, schedule and pay requirements. As you’re looking for jobs be wary of scams. Never pay to get a job unless you’re purchasing required equipment and when in doubt check the company on the Better Business Bureau website. We also have a list of 100 other flexible jobs here. 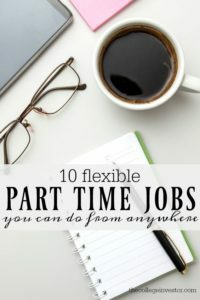 Are there any flexible part time jobs you’d add to the list? Great list Alexa. Interesting how, with a little effort, you can actually make a pretty decent income on the side. And it doesn’t have to be that complicated. Choose something, try it for a few weeks, measure the results and continue if it makes sense. Thanks for the post.